The OMEGA PRG700 Series regulators are designed for applications that require high flow capacity and accurate process control. 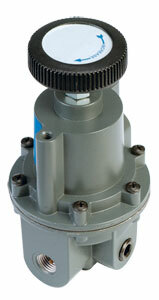 A poppet valve balanced by a rolling diaphragm insures a constant output pressure even during wide supply pressure variations. Stability of regulated pressure is maintained under varying flow conditions through the use of an aspirator tube, which adjusts the air supply in accordance with the flow velocity.